Controlling unauthorised access helps us protect the Special Areas. 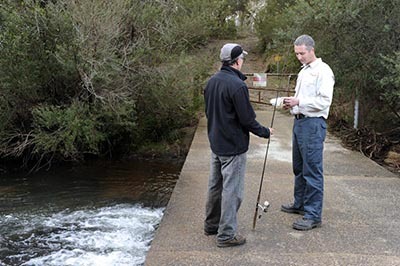 While WaterNSW and the NSW National Parks and Wildlife Service (NPWS) jointly manage the Special Areas, WaterNSW has primary responsibility in managing public access around the water storages in the Special Areas. Enforcement programs - surveillance activities using cameras and patrols to identify illegal activities and high risk sites, including issuing penalty infringement notices and prosecutions. Fines up to $44,000 apply for people who are caught ignoring the restrictions in Special Areas. Targetted enforcement activities are carried out in partnership with NPWS and NSW Police. This brochure explains what you can and can't do in Special Areas - whether No entry, Restricted and Controlled Areas. It also outlines the opportunities available for visiting and undertaking recreation in Special Areas. This map shows the location of all of the Special Areas and their boundaries in Greater Sydney's drinking water catchments.